provided Santa at Fox Valley. covered some Santa duties at Wentworth Garden Centre. visited a number of Care Home in the area to sing carols to the residents, including Denby Dale (where one of our Honorary members resides). visited Woolley Wood School (small primary special school for children with severe and complex learning difficulties and disabilities) to hand out goodies. and: Wortley -> High Green -> Chapeltown -> Grenoside -> Ecclesfield -> Chapeltown -> Thorpe Hesley on Christmas Eve. Thanks to all who volunteered to man the events, and to all who turned out to support them and visit Santa or contribute to the bucket collections. 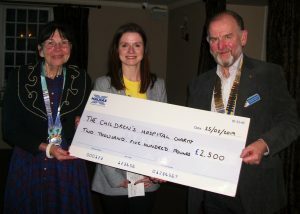 We welcomed DG Cheryle Berry to our club meeting on February 25th this year to talk to to us about Kerala and “Prepare to save a Life”, before helping our President Steve Knight to present a cheque for £2,500 to Abbie Pervin from The Sheffield Children’s Hospital Charity – This was the biggest beneficiary from last year’s Vintage and Classic Car Rally.